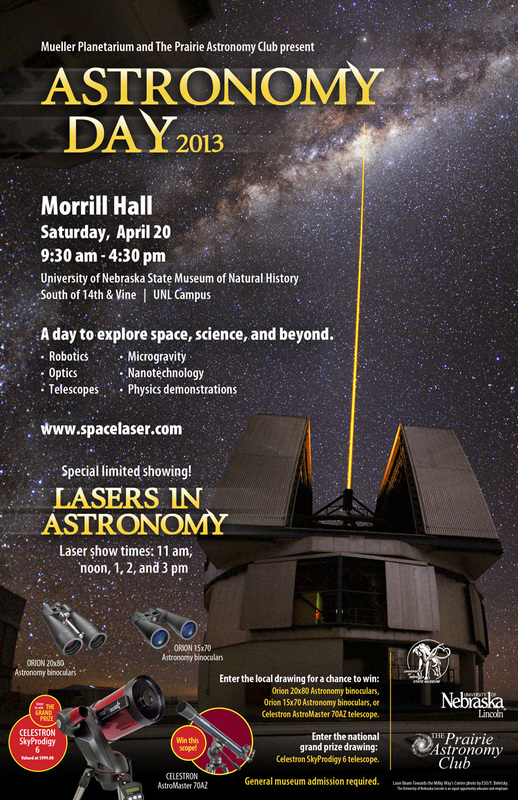 Astronomy Day will be celebrated April 20 from 9:30 a.m. to 4:30 p.m. at the University of Nebraska State Museum of Natural History in Morrill Hall, south of 14th and Vine streets on the University of Nebraska-Lincoln City Campus. The event features prizes, educational laser shows, and activities about space, science and more. Regular museum admission will be required. Museum members are free. Attendees will learn about planets, optics, telescopes, physics, robotics, space travel, nanotechnology and more. Presenting organizations include Mueller Planetarium, Prairie Astronomy Club, Hyde Memorial Observatory, Nebraska Center for Materials and Nanoscience, UNL Department of Physics and Astronomy, UNL Microgravity University team, UNL Chapter of the American Institute of Aeronautics and Astronautics, UNL Department of Engineering, King Middle School, Air Force Association, and others. Mueller Planetarium will present "Lasers in Astronomy" by Prismatic Magic. 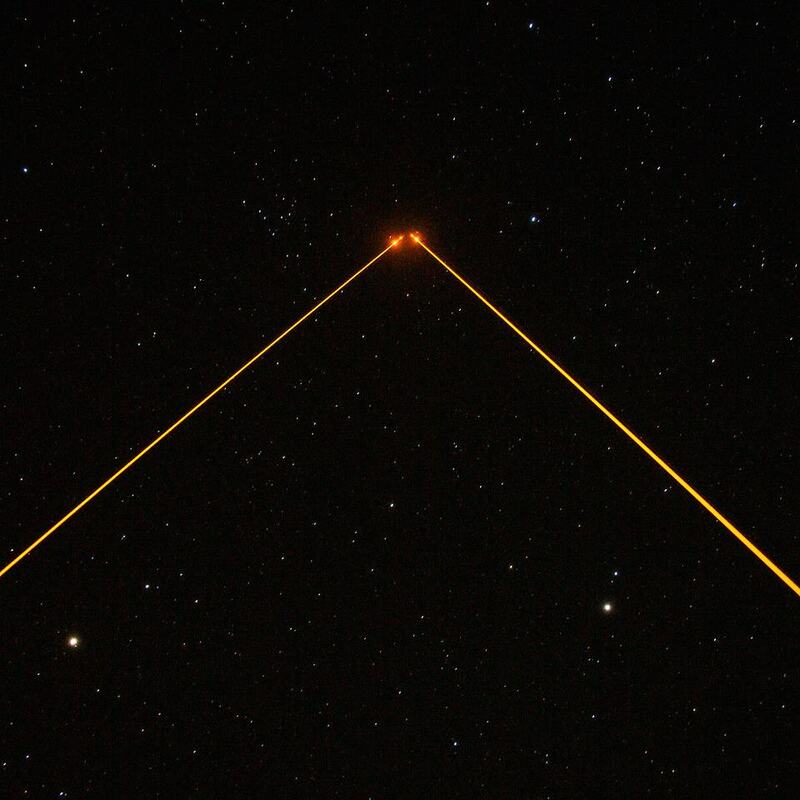 This educational laser show explores how state-of-the-art laser technology is helping astronomers better understand the universe. Show times are 11 a.m., noon, 1, 2 and 3 p.m. There will be additional showings on April 21 at 2 and 3 p.m. Tickets must be purchased at the front desk on the day of the event; $3 adults, $2.50 children 18 and under. The show is 40 minutes running time. Sponsorship of this show is provided by the International Society for Optics and Photonics. Attendees will have a chance to win a telescope or one of three pairs of binoculars from the Prairie Astronomy Club. Entry forms for this local giveaway will be available at the museum's front desk. The drawing will take place at 4 p.m. Visitors need not be present to win. Visitors who do not win the telescope awarded locally will have the opportunity to register to win the grand prize Celestron telescope that will be given away nationally by Astronomy magazine in the weeks following Astronomy Day. Astronomy Day will conclude with an open house "star party" during the regular open hours (8 to 11 p.m.) of Hyde Memorial Observatory, 3701 S. 70th St. in Holmes Park. There is no admission charge at Hyde Observatory. Founded in 1973, Astronomy Day is a national celebration started by the Astronomical League to promote awareness of amateur and professional astronomy. Astronomy Day events will take place at hundreds of locations across the globe on this day. Of all the locations, Mueller Planetarium is among a select group of more than 30 planetariums, museums and observatories across the United States to be sponsored by Astronomy magazine and Celestron International as outstanding examples of the spirit of amateur astronomy. Mueller Planetarium is the only site endorsed by these organizations in the state of Nebraska. For more information on Astronomy Day, contact Jack Dunn, coordinator of Mueller Planetarium by email, or visit the Astronomy Day webpage, http://www.spacelaser.com/ADay2013.html. The University of Nebraska State Museum of Natural History in Morrill Hall is open 9:30 a.m. to 4:30 p.m. Monday-Wednesday and Friday-Saturday, 9:30 a.m.-8 p.m. Thursdays, and 1:30-4:30 p.m. Sundays. Regular admission is $6 for adults (19 and over), $3 for children (5-18 years, 4 and under are free), and $13 for families (up to two adults and children). UNL staff, faculty, and students are admitted free with UNL ID. Museum members are also free with a valid membership card. There is an additional charge for planetarium shows. Parking is free in front of the museum. For further information, telephone the museum at 402-472-2642, or visit http://www.museum.unl.edu or Mueller Planetarium's website, http://www.spacelaser.com.